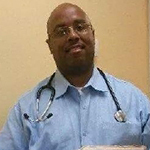 Dr. Winston McIver, Jr. is a native to Conway, SC. He attended Morehouse College and went to medical school in Tennessee. He stays busy with his practice, Waccamaw Primary Care and serving as the team doctor for Coastal Carolina. His goal is to provide good healthcare and to bridge the gap of those that need healthcare. He enjoys being able to simplify things that seem complex so that his patients understand. Dr. McIver spends his free time with his family and watching the Steelers play.